Here are my thoughts on a few Oz books I’ve read recently. Non-Oz book reviews should be coming soon. The Prankster of Oz, by John R. Rose – It’s weird how Oz items I’ve never heard of sometimes show up on Amazon. Shouldn’t the online Oz community be on top of these things? It’s not like it’s easy to search, as “Oz” yields a lot of unrelated results, as well as countless editions of the original books. According to his biography, the author grew up on a farm in Kansas, and is a fan of Westerns and pulp novels. So perhaps it’s not surprising that this book comes across as somewhat of an Oz Western, not because it takes place in the west of Oz (well, some of it does, but more of the action is in the Munchkin and Gillikin Countries), but because it’s an Oz with ranches, homemade pies, razorback hogs, and a covered wagon. These things are all introduced in a framework that fits in pretty well with L. Frank Baum’s original conception of the fairyland, however, and featured characters include Woot the Wanderer and Captain Fyter. New visitors to Oz are a retired farmer, a wandering boy, a mule who’s actually one of Santa Claus’s reindeer under an enchantment, and a dog made of wire. The titular Prankster turns out to be the one who transformed the reindeer, and also worked many other nasty spells around Oz. He apparently does this just for fun, but we really don’t even see him until he starts feeling remorseful about his actions. We might have been able to use a little more of his working the enchantments in the first place. The ending is somewhat abrupt, leaving it a mystery as to whether the visitors decide to stay in Oz or return home. It’s definitely a different sort of take on Oz, but one that shows a clear fondness and familiarity for the series. 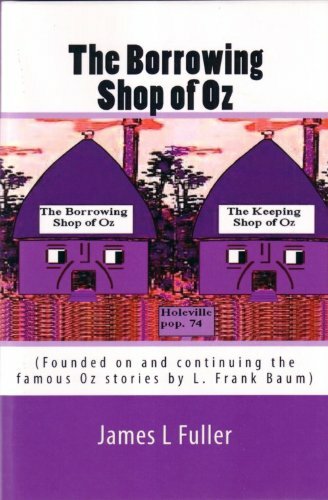 The Borrowing Shop of Oz, by James Fuller – I’d heard of Fuller’s books some years ago by way of Joe Bongiorno’s Royal Timeline of Oz. Some of his works have an adult Dorothy, but others are in a more traditional vein, and this is one of the latter. The plot centers around a shop where Ozites can borrow things that disappear from the Outside World, and then return them later. I’m not entirely sure why this is necessary, and it seems like it could cause problems. For instance, if the Wogglebug has borrowed my toothbrush this way, he really should have just kept it. Anyway, Scraps borrows a camera belonging to the Polos, an American family, and her pictures get mixed up with theirs. The Polos are transported to the shop and travel to the Emerald City, encountering Betsy Bobbin and the Hungry Tiger and seeing some of the sights from Glinda of Oz along the way. There are also some rodeo clowns, which is weird when I’d just read another Oz book with Western elements. When they arrive in the capital, Scraps, who is serving as interim ruler, has them arrested because no outsider is supposed to know about the borrowing shop, including Dorothy, who is a Princess of Oz. With Dorothy’s help, they escape to Glinda’s palace where Ozma is staying, only to have their food drugged and to be forced to stand trial. I would imagine Fuller was inspired by the trial in Patchwork Girl, only this one seems even more pointless as Ozma just repeals the old law that keeps outsiders from knowing about the shop. It makes the familiar characters come across as a bit sinister. The Polos don’t come across as particularly interesting, and the writing could have used a little more zest. The premise and some of the elements are pretty good, but it could have stood a bit more fleshing out. 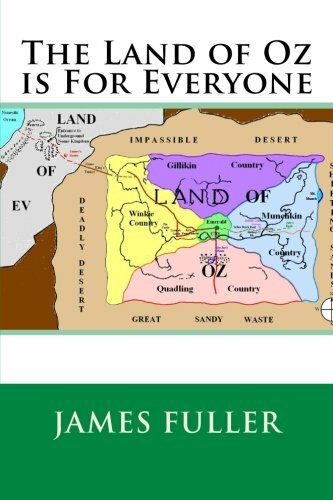 The Land of Oz Is for Everyone, by James Fuller – This one has another large group of Americans visiting Oz, in this case a multicultural group of students and their teacher. The kids have learned prejudices from their parents, so Ozma arranges a team-building exercise to get them to work together and understand each other. One group of students is transported to the Munchkin Country, another to the Quadling, and a third to the Land of Ev. It’s a little heavy-handed, but what bothered me more is that the characters don’t really do that much while in fairyland. 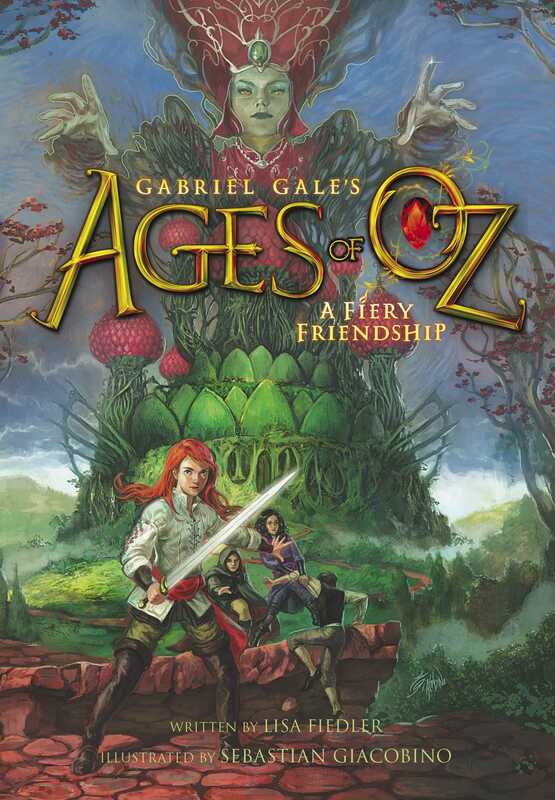 Ages of Oz: A Fiery Friendship, by Lisa Fiedler and Gabriel Gale – This is the first book in an intended series from Simon & Schuster, which is pretty impressive. It’s a prequel to the Baum books set in the eighteenth century, starring a young Glinda and Locasta. They’re joined by a boy from the New York colony and a bald eagle in their quest to overthrow the Wicked Witches who have conquered the four countries of Oz. There are a few things the book has going for it, including Baum-related references (character names include Matilda, Maud, and Gage), fun and Ozzy-sounding names like Aphidina and Abrahavel J. Squillicoat, some word puzzles and puns, an attempt at a developed history of Oz, and the running gag about the useless classes taught at Glinda’s school. I also suspect the Queryor might have been inspired by the Curious Cottabus. Still, the book didn’t really grab me. Many of the right elements are there, but it doesn’t come across as all that Ozzy, and the writing doesn’t strike me as especially engaging. I sometimes found myself forgetting that certain characters were present, or why they were there. I guess coming at it from the point of view of a long-time fan makes me a bit biased in the sense that I’ve read fan-written works better than this, and they didn’t get anywhere near the same level of promotion. Regardless, if this series can get more people interested in Oz, that’s a good thing. This entry was posted in Book Reviews, Characters, L. Frank Baum, Oz, Oz Authors, Ruth Plumly Thompson and tagged a fiery friendship, ages of oz, captain fyter, gabriel gale, glinda, glinda of oz, good witch of the north, james fuller, john r. rose, lisa fiedler, ozma, patchwork girl, the borrowing shop of oz, the land of oz is for everyone, the patchwork girl of oz, the prankster of oz, witches, woot the wanderer. Bookmark the permalink. Might I entice you into reading Nomes of Oz, which brings the MGM 1939 Wizard of Oz film into the Land of Oz and includes dragons, dragonflies and snot otters? As to your first point, I think that in the ’90s, when Oz books were a bit scarcer, fans were more excited about new releases that they discovered. Now, with a glut of Oz-titled/related books out there, most of which are re-imaginings (nothing against them, but for those of us interested in the expansion of the original series, yet another re-imagining is just not as exciting), I think it’s become harder to parse out which is a legitimate expansion of Baum’s universe and which is a reinvention of it. For example, I’ve had PRANKSTER on my shelf for awhile, but haven’t had time to get to it, so I wasn’t sure what it was. It’s also a small fortune to try and get everything with the Oz name on it (and I’ve tried), so I’m sure I’m not alone in having to limit what I purchase now. This makes identifying Baum-universe expansions much more difficult than before. Fuller’s books: I’ve had manuscripts and now printed books of his titles forever, and definitely intend to get to them. They actually seem like cute and lighthearted stories, which your review suggests, and I’m looking forward to that (much to everyone’s surprise, as they assume I only like heavy, deep and dark material, lol). I corresponded with Fuller many years, and found him to be a kindhearted and generous man who just loved Oz and loved writing about it. I’m glad to see that you’re reviewing them. Ages of Oz: I can write a very long dissertation on the pros and cons of this book, the latter of which are annoying only in the sense that Gale (whose story it is, though he didn’t write it) proclaims that he’s the ultimate Royal Historian, has studied Oz history, and knows the “truth” of what happened, and yet he gets so many details wrong. For example, readers of Oziana know that Gaylette is Glinda’s mother, not Tilda (unless Tilda later takes on the Gaylette name, which is possible). Then, there’s the issue of Mombi, who he makes the wickedest witch of the wicked witches, and has East and West serving her. This runs contrary to what we learn of Mombi in the canonical and post-canonical books, where Mombi is actually far less evil than the other compass witches. She’s never shown actually killing (or even ordering the killing) of anyone, and she has every reason and opportunity to do so. She keeps Ozma alive and raises her relatively well (judging by Tip’s attitudes and behaviors); she keeps her father Pastoria II alive; she keeps his wife and counselor alive; she keeps Ozroar alive. She’s got the entire royal family in the palm of her hand, and all she does is enchant them into other forms where they’re safe but out of the way. The Wizard even felt he could trust her to keep Ozma safe from the other witches, and he was ultimately proven right. Readers of Oziana and OzStory Magazine learn that Mombi is actually cared for by Ozma, who not only visits her, but grants her her life (despite what was shown in The Lost King of Oz). Now, it *could* be argued that the Mombi of Ages of Oz it’s a different Mombi, a predecessor who was truly evil. This or another retcon would have to be the case, as Paul Dana’s forthcoming book makes it clear that the Mombi we know was born under a different name in 1733, and wasn’t controlling the compass witches at this time. We’ll have to see what future books bring about, but it’s clear to me that in the worst case scenario Gale is probably unaware of anything past Baum’s writings, and in the best case, knows only the Forty. So, the idea of him “knowing Oz backwards and forwards…” having “studied its history,” as he indicates in the preface, seems rather unlikely given what he’s revealed so far in Ages of Oz. I wish it were otherwise, because I actually like the idea of exploring Glinda’s past, and the story is fun, if a bit formulaic in that it reads like a Young Readers fantasy book (this is in part due to Lisa Fiedler, who is a professional author… and IMO a bit too polished and modern for the story being told). It would be nice if he’d actually done the homework he claims he did. One of the reasons I post articles like this (http://www.oztimeline.net/Appendices.htm#XI. Glindas History) is for that very purpose (your own articles serve a similar purpose). On the plus side, it’s good to see a relatively Baum-friendly Oz book published by a big publishing house again. Now, with a glut of Oz-titled/related books out there, most of which are re-imaginings (nothing against them, but for those of us interested in the expansion of the original series, yet another re-imagining is just not as exciting), I think it’s become harder to parse out which is a legitimate expansion of Baum’s universe and which is a reinvention of it. Yeah, I feel the same way. I kind of wish new Oz authors were more forthcoming about whether their works were FF-consistent, but I guess the majority of readers don’t care. On the other hand, you’d think they’d be more eager to reach out to people who would likely be a guaranteed audience. I think you’ve identified something significant when you point out how stuff like Glinda and Mombi’s pasts have already been explored. I feel the same way you do, that there’s no reason to reinvent the wheel in such cases. But I think other writers just don’t care that they’re treading the same territory, especially when the earlier works are in fairly obscure sources like old Ozianas. I’ve pretty much given up hope of Ages being part of the Oz Expanded Universe, such as it is. For one thing, it sets Glinda’s childhood explicitly in the eighteenth century, while “Solitary Sorceress” has her arrive in Oz during the reign of Queen Elizabeth I. I guess it’s possible she could have overdosed on the youth potion Lurline gave her (wasn’t she an old woman at the time of the enchantment, according to Paradox), but that’s probably clutching at straws like a Hip-po-gy-raf. I’d be happy if ‘scholars’ paid attention to the 40-book series and Bum’s non-Oz fantasies. I don’t think there’s anything in A Fiery Friendship that specifically contradicts Baum or the FF, although the book’s account of the downfall of King Oz might be difficult to square with Lost King.